ENTER OEM, FIRESTONE, GOODYEAR, OR HENDRICKSON PART NUMBER IN SEARCH BAR ON TOP OF PAGE! Hendrickson air springs are designed and tuned specifically for approved applications. Choosing an air spring other than the original can alter the performance of a suspension. Variations in internal bumpers and flexmember bias can affect how much weight is carried by a given amount of air, which could mean a front axle in a tandem weighs out differently from the rear. Ride quality and performance are key factors when designing the internal make-up of Hendrickson air springs. A low natural frequency is achieved through proprietary piston and bump stop components. Hendrickson air springs undergo advanced design and testing processes to provide enhanced suspension ride, handling and performance. That's why it's important to spec only genuine Hendrickson air springs. We stock more air springs that are not listed on our web pages. If you don't find an air spring part number that matches your needs, please use our Contact Form to find out if a Hendrickson air bag is available for your truck. Also, please use our contact form to inquire about quantity purchases of air bags and air bags not listed in our catalog. 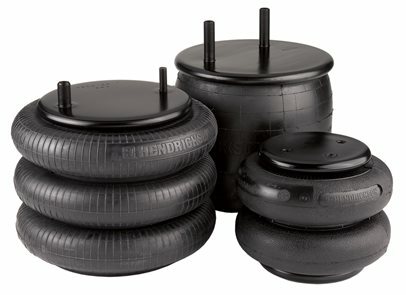 We offer replacement Firestone air bags and Hendrickson air springs. Please indicate any suspension air spring part number information on the inquiry form.